While hydraulic cylinders can have strokes that measure several feet in length, a small hydraulic cylinder has a much smaller stroke, often less than an inch in length. Small Hydraulic Cylinders – Cylinders & Valves, Inc.
Small hydraulic cylinders are characterized by their small size and short stroke length. Stroke length is the distance that the hydraulic piston reaches at its fully extended state, and in some cylinders such as telescopic hydraulic cylinders, the stroke length of a piston can be much longer than the size of the cylinder. Small hydraulic cylinders, like other cylinders have the same main parts: the outer cylinder barrel and the hydraulic piston and piston rod which is used to force the piston through the cylinder. A hydraulic cylinder works because of the pressure built up by the hydraulic fluid inside the cylinder. This hydraulic fluid is typically a type of oil, or in some cylinders, water is used instead. The piston moves this liquid creating kinetic energy and pressure which is then used to create linear force. 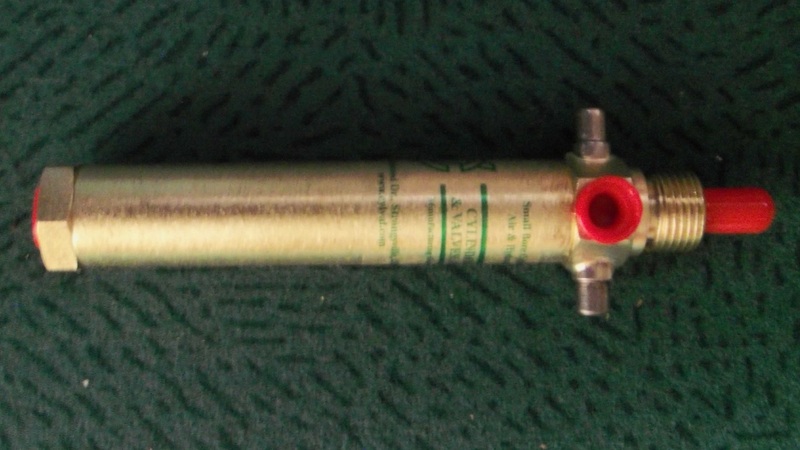 In small hydraulic cylinders, the rod gland and rod wear ring are often composed of a single part. Due to the compact size of the interior of the cylinder, there is no extra space for multiple moving parts and therefore this helps to conserve space. The cylinder must be sealed to contain this build-up of pressure and to ensure it is directed in the area of its intended output. Furthermore, the cylinder itself must be able to withstand the pressure and therefore is commonly built of a strong and durable metal such as steel or aluminum. Although they retain all the capabilities of larger hydraulic cylinders, with less power output and range of motion, small hydraulic cylinders are typically used in applications such as military instrument construction or robotics, which require high precision. Other uses include the steering mechanisms in domestic appliances such as lawnmowers, appliances on recreational vehicles and some waste equipment. Specialized small hydraulic cylinders are able to be designed and constructed, and can also be single acting or double acting according to the way in which the pistons move to create push and pull power, and whether or not they can extend and retract. The piston is typically coated with a corrosion and wear resistant material such as chrome in order to ensure the longevity of the operation power. However, hydraulic systems still need to be cared for and maintained, and the hydraulic fluid may have to be replaced or refilled from time to time for optimum operating capacity. Small Hydraulic Cylinders Small hydraulic cylinders serve the same purpose as standard or heavy duty hydraulic cylinders: to convert hydraulic pressure into linear force and motion.